Amongst all the Asian bakery shops in Hong Kong that I tried Pai Bao, Maxim’s bakery was on the top of my favourite list. 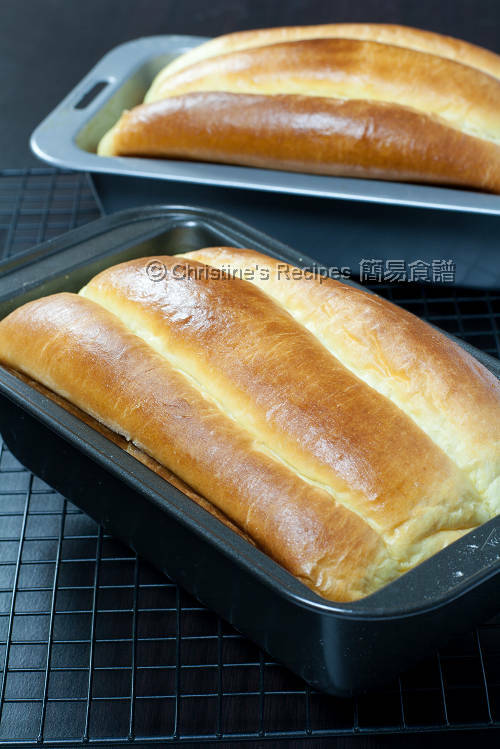 “Pai Bao” (排包) is a kind of Asian sweet buns, arranged and baked in long rows. Maxim’s Pai Bao has rich eggy and milky flavours, super soft and fluffy. I hardly find another bakery shop in Hong Kong that can beat them in making Pai Bao. Sadly, I can’t have Maxim’s Pai Bao as many as I could when I was in Hong Kong. As you might’ve known that I’m getting addicted to making tangzhong breads more and more. Then a question came up in my mind. 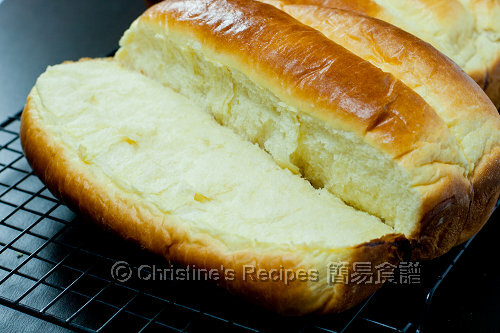 If you crave for those lovely, soft Pai Bao, why not try to make some with tangzhong? From getting the idea to getting the wonderfully soft Pai Bao on hands, it took me quite a lot of time of refining the recipe. After two trials, not much satisfied with the taste and texture, finally I got the homemade Pai Bao that I love the most, very close to those of Maxim’s. Up to the time of writing this post, I think this is the stickiest tangzhong dough I’ve ever made, and also the most fluffy and softest homemade bread I’ve ever enjoyed. If it’s not impossible, it would be tremendously hard to knead the dough by hands. Please take this as a kind note that this bread is very easy to make as long as you use a breadmaker. Many fans of my Chinese blog showered me with emails asking what brand of breadmaker I use. My breadmaker is the very basic model of Sunbeam. I just bought it for kneading dough because I like shaping the dough myself and bake breads in oven to have more fun and ensure the best results. You can use other brands of breadmaker though. The key is to let your dough properly be kneaded to the “elastic stage”. Why didn’t I use a stand mixer? I experimented with my stand mixer once. As this tangzhong dough, especially the one of Pai Bao is extremely sticky, the dough was stick to the hook and curled all the way up to the top. Having tried many times of scraping the dough out and get it started again, the dough couldn’t be kneaded properly after a long time. I ended up with turning the dough back to my breadmaker. Having gone through all the trials and errors, I keep using my breadmaker to knead tangzhong dough since then. I must say that I’m really satisfied with the end results. The texture of every tangzhong bread is exactly like the kind that I’m after, very fluffy and remains soft for days. Add all ingredients (except butter) into a breadmaker, first the wet ingredients (milk, cream, egg yolk, whisked egg, tangzhong), then followed by the dry ingredients (salt, sugar, milk powder, bread flour, yeast). (Note: I used to make a small well in the bread flour, then add the yeast into it.) Select the “dough” mode (refer to the menu of your breadmaker to select the kneading dough programme). When all ingredients come together, add butter, continue kneading until the dough is smooth and elastic. (The time of kneading in my breadmaker is about 30 minutes.) Then let the dough complete the 1st round of proofing, about 40 minutes, best temperature for proofing is 28C, humidity 75%, until double in size. Transfer the dough to a clean floured surface. Deflate and divide into 6 equal portions (see picture 1). Cover with cling wrap, let rest for 15 minutes at room temperature. Roll out each portion of the dough with a rolling pin into an oval shape (See picture 2). Fold 1/3 from top edge to the middle and press (see picture 3). Then roll to the bottom. Pinch to seal (see picture 4). Turn seal downward. Roll and stretch to about 20cm in length (see picture 5). With seal downward, place in the loaf tin. Repeat this step with the rest of the dough. Let proof in the tins, covered with cling wrap (see picture 6). The best temperature for 2nd round proofing is 38C, humidity 85%. When the dough rises and almost reaches to the rim of the load tins, lightly brush the surface with whisked egg. Bake in a pre-heated 180C (356F) oven for 25 to 30 minutes, until turns brown. Remove from the oven and transfer onto a wire rack. Let cool completely. Christine - I have a suggestion for you - I think you need to open a bakery! Amazing stuff coming out of your kitchen! Either that, or a cooking school! I like HK sweet bun too!! We have Maxim bakery in NYC too...I guess mostly the bakery here are from HK branch...like Taipan,Fei tat...well this bun really look great!! thanks for sharing..I'm going to try this recipe soon!! Thanks for all the baking recipes. I made the tangzhong few times and the buns were soft when they came out fresh from oven but they seemed to be heavier than those buns I buy from the bakery. They became heavy and hard the next day. Do you have any suggestion ? wow The Pau looks so soft and fluffy! Awesome! Looks so soft and yummy! Just wondering how to tell whether the dough has doubled in size/finished rising in the second proofing after buns have been shaped (apart from looking at the size)? Do I just poke it and see whether it shrinks back immediately (like for the first proofing)? Thanks! OMG... this bread looks amazing. I really need to start learning how to make tangzhong. Yum! I find it very difficult to handle the dough using the tangzhong method, so if you let the breadmaker do the work, will the dough be sticky after proofing for 10 mins.? I did try once and also find it very sticky. My breadmaker is Kenwood. I'm itching to give it one more shot! For the first proofing, you can poke a powdered finger to test if the dough is proofed enough. It's no problem coz you have to deflate the dough and shape it. But for the second proofing that's after shaping your dough, don't poke it because you don't want your baked bread with a big hole in it. I just eye that size doubled in size. The dough of Pai Bao is extremely sticky. Even though having kneaded by my breadmaker for enough time, it's still sticky. The first round of proofing is about 40 minutes. After proofing, the surface is not sticky as before. You can turn it out to deflate and divide it. Just sprinkle a bit of flour on the outside to help shape properly. Try to avoid from turning the inside out, the inside is still very sticky. After dividing, rolling, let rest for 15 minutes, then the dough becomes easier to handle. After 15 minutes rest, you'll get no problem of rolling it into tube-like shape. The last round of proofing is about 40 minutes. The kneading and proofing are two crucial factors to have tangzhong breads baked successfully. As tangzhong retains much moist inside, the bread would be a bit heavier than the regular ones. But it shouldn't be too heavy. You have to knead your dough well enough and let it proof double in size. If you grasp these two principles well, the end results would be wonderful. What gorgeous and perfect sweet rolls. I would certainly love to make this. Sounds easy, the way you explain it...but maybe not for us, who hasn't made it. I don't think I have tried Pai Bao? I live in a high altitude area, my bread usually are denser. Do you have any suggestion? Thanks. 1) Have you tried using fresh yeast instead? How long would the 1st and 2nd proofing be? 2) Does it matter if the tangzhong heats up just below or above 65c or does it have to be exactly 65c. I found that my bread is not as soft and fluffy as your pics and doesn't stay soft for more than 1 day. The amount of tangzhong used and the quality of proofed dough would impact the result significantly. Did you proof your dough enough? How was your dough after the second proofing? Was it light and fluffy? 1) I haven't used fresh yeast because I've got heaps of instant dried yeast in my pantry. I don't want to waste them. Besides that, instant dried yeast is most suitable for using in breadmaker. If you use fresh yeast, the proofing step is the same. The time of proofing depends on the weather and temperature, and varies every time. But you might expect around 40 minutes. The warmer the weather, the shorter and quicker for proofing. But don't go too far, as longer proofing time would generate better bread dough, your bread would has sweeter smell. 2) I didn't use a thermometer to check the temperature while cooking tangzhong actually. I stir the flour and water mixture constantly on low, cook until I see some "ribbons" patterns, that's the consistency we're looking for. Every time it worked. Is the tangzhong meant to be a bit runny or quite pasty? The tangzhong looks like paste. Please take a look at the picture on my chinese blog here. You'll know how it looks like. I love pai bao! I've tried a much simpler recipe, not tangzhong as I didn't have much luck with tangzhong. Shortlisting this recipe first. If doing the PaiBao, I dun wanna use condense milk,is there any thing can be replace? is it a must for putting the condense milk? can I skip using this? If you don't want to use condensed milk, you can skip it. No problem at all. Hi Christine, can I ask you about the tangzhong, is it room temperature tangzhong or cold tangzhong? I mean, when you are making the bread, do you take the tangzhong out from the fridge and use it directly or you let the tangzhong to room temperature and then use it? You can use the tangzhong once it cools down at room temperature. Any leftover can be kept in fridge for a few days. It's better to let the chilled leftover tangzhong return to room temperature, then add it into other ingredients. 1) If I wanna measure using thermometer, what should be the correct temperature? I don't know whether I've got the so called 'lines' but it's now very sticky. Like a glue. Did I get it right? 2) The 1st & 2nd round of proofing. Can I just let it proof and disregard the temperature? I'm staying in Malaysia. 3) Refer to picture no.4. Is it right I roll the bottom up the pinch and seal onto the middle section of the top which I've just pressed down in picture no.3? 4)Do I hv to butter the entire loaf tin before placing the dough in? thank you for sharing the recipe and I hope the bread will turn out as good as yours. I cannot fail!!!! 1.The tangzhong is supposed to be cooked to 60C. Actually, I didn't use a thermometer every time I cooked tangzhong. It's like glue, contains much moist in it. 2.As for proofing, you can judge whether your dough is proofed enough or not by sight. If double in size, it's fine. The weather in Malaysia is quite warm, isn't it? No problem at all. The higher temperature, the shorter the proofing time. 3. Yes, it's a way to roll and pinch your dough into a log. 4. My baking tin is non-stick. If yours is like mine, you don't need to grease it before placing the dough in. If not, you have to grease it in order to help remove the bread easily. 1. My tangzhong is like kinda solid pasty glue. It has a 'shape' therefore, it's not that runny. Did I overcook it and get it wrong? 2. I forgot to whisk the 30g egg. Do you think this will contribute to my failure? I also omitted the condensed milk. 3. The dough program takes 1 hr 30 mins to complete kneading and proofing for my kenwood machine. When the dough comes out and I tried to roll it oval shape, it kinda 'pull' back slightly as I roll. Is this normal or it's already a sign telling me something is already wrong with the dough? 4. My dough is now on 2nd proofing in tin and guess what? It's not rising at all. It stays the same shape as before. I'm still hoping it will proof. Thanks in advance for your comments. I must do it again till I get it right. Thank you. 1.If your tangzhong has a "shape", you might have overcooked it. It should be a bit runny. 3. It seems that your dough wasn't kneaded or proofed well, so the gluten inside was established well or could be destroyed in some way. I definitely have overcooked the tangzhong. I cooked it again last night and this morning, I took a day off from work partially to bake this bread and .....I succeeded! (success = above edible). At one point, I thought the dough would not rise and I left it in the tin and went out. When I came home 7-8 hours later, the dough had kinda overflowed slightly from the tin. Naturally, you can't see the shape of the 3 distinct 'long stick' in the tin. Yes, the bread is soft but not as soft as your picture promised. You can see my bread pix in my blog. Still, I'm satisfied as of now. I hope to make again on Monday. Thank you so much for sharing the recipe. I wonder why your dough took so long to proof. Normally, it requires 45mins or so for 2nd round. Was the weather when you made the bread very cold? New time, you might try to place the dough in a big plastic box, or in the oven (don't turn on the power at this point), with a glass of hot water to facilitate the proofing. It would shorten the proofing time. The temperature was good. Then it's not because of the temperature. You don't need those steps I mentioned above to shorten the proofing time. There should've been other things wrong when making the dough. WOW.. can't wait to try it! I haven't had these in ages!! thx so much for sharing the recipe! i've also got a quick question christine, does it have to be baked immediately after 2nd proofing? or will it be ok to put it in the fridge and baked the next morning?? (i want to eat fresh bread for breakfast, but don't want to wake up so early to proof it and everything). also, what type/brand of milk powder do u use? is it ok to use liquid milk? hi christine, i tried your recipe last night. I used my mixer with the dough attachment to mix the dough and that seemed alright. but when it came to the proofing, it took super long. i waited for at least an hr for the 1st proofing, it had increased a bit, but not double. but because it was time to sleep, I rolled it quickly and put in the tins and went to bed. After about 7 hours, the tin was only bout 80% full. I live in sydney. Is there something wrong with my dough to take so long to proof? Did you mean that the 2nd round of proofing was in night time? The temperature at night in Sydney wouldn't be too cold, right? It's weird that your dough took such long time to rise. I made this Pai Bao several times, only took 1 hr or so to proof every time. No clues. christine, if I didn't proof it enough the 1st round, would that affect me 2nd round of proofing? Sydney's night temp is about 25 degrees, but i kept it in the microwave w/ a bowl of hot water. Each round of proofing is important. You're doing right to keep the dough being proofed in the microwave w/a bowl of hot water. Did your bread turn brown too quickly? The crust of your bred turned dry and hard was because of high temperature. Try to decrease the oven temperature a bit next time. It should improve. Thank you Christine for this wonderful recipe! I made the Pai Bao and it was so soft and tasty. It was soft for many days and I was so happy with the results. Oh, so glad to hear that. Happy baking! oh my goodness? This is my favorite bread EVER! Any idea how i can use the breadmaker through out to make a loaf of bread that is soft like the ones you have without shapping? Currently using the Tangzhong method but baking within the breadmaker, too lazy to shape and put into oven. Just add all the ingredients in your breadmaker, follow the instructions in the manual and select the appropriate mode. Mine has got one called "bake" - the machine will do all the job, from kneading to baking. Hi Christine, I followed your recipe exactly .. except I didnt have a breadmaker, so I mixed everything and kneaded the dough by hand. The dough is very very sticky!! I ended up incorporating a lot more flour while kneading it until it was elastic and springy. Although there was a lot of hard work involved in kneading the dough , it came out FANTASTIC! The flavour was Perfect and the texture was soft and fluffy, just like the asian bakery shop Pai Baos. Wow, you kneaded this pai bao dough by hand?! That's the stickiest tangzhong dough I've ever made. You're a fantastic baker. I really share your joy. Congrats on your success! For making this soft and delicate bread, it's better and accurate to use an electric kitchen scale and measure all the ingredients. hi christine, i just want to ask where i can buy bread flour in australia. the ones that they're selling in coles are pre mix bread flour. thanks.. The premixed flours are not suitable for this recipe. I'm using Defiance, White Baker's Flour from Coles, 5kg packet. Oh! Luckily I read thru the posts before I make e bread. So I'd overcooked the tangzhong! Gotta make another one tmw. Christine, can I know if you have added e whisked egg or e egg yolk into e mixture or both? Coz it's not stated clearly in e receipe. Thanks! Yes, whisk the whole egg, including the egg white with egg yolk. Then you measure out the quantity this recipe calls for, then mix with other ingredients. Thank you for this recipe, I baked , and buns are delicious! Hi Christine, I'd like to try your recipe but I couldn't find the full cream milk powder. Can I just use nonfat dry milk? I used Pauls' pure cream, that's a kind of pouring cream. Is nonfat dry milk a kind of powdered milk? That would be fine if you like to use it. Hi Christine, thanks for your reply. Yes it's powdered milk. I'll try to use it. I'd tried your recipe, my bread came out good and so soft but dry. Do you think I should substitute the milk with whipping cream or add more butter to make the bread moist? I still like the bread, this is the first time I found the good bread recipe, thanks for sharing. Did you bake your bread in a breadmaker or oven? If using breadmaker to bake, the bread would be drier. Yeah, feel free to adjust what you think might be right in your condition. Every oven is so different. In Australia, thickened cream is very like whipping cream, with thicker texture, and gelatin is added. thank you so much! this is my first time making this kind of bread and it turned out absolutely soft and fluffy! thank you! I was wondering if I used too much wet ingredient because my dough was like very thick batter after the kneading was done in the bread machine. It was VERY sticky. Yeah, the dough made from tangzhong is very wet and sticky. Sprinkle a bit of flour on the surface, that will help the shaping of the dough more workable. I have been making your TangZhong buns for a couple of months now. Tried the Hokkaido bread and the cheese bread. They were MUCH better than any other bread recipe I had tried. The silver lining is, the buns were always good and turns out that they CAN GET BETTER.... :) Gazillions thanks for theses recipes. PS: Do you know that in the western world, they used (in the 50's) similar water roux (TangZhong) to make butter cream. This is to reduce the use of sugar, yet butter cream holds well. Thank You Christine! I will give it another try this weekend. Ahhh I love these tray buns! (that's what they call them here). I'm gonna try making it tomorrow. What is the whipped cream for? I tried making small buns like the ones from chinese bakeries (my first bread) and they came out dry. My 4 yr old son Who LOVES bread tried one bite and reached for his water lol poor boy. I used the wrong flour coz the bags look the same. I used all purpose dlour and I did n't know the dough was supposed to be sticky since it was my first bread so i added TONS of flour to make it not sticky. I tried making the raisin tray buns yesterday, but this time i reserved 3/4 cup of flour from the recipe to dust the dough while kneading. Maybe you can tell your readers who are newbies like me (no bread maker) to do the same thing. Anyway, I splitted the batch into 2 and I added 1 small purple sweet potato in the second batch. I put the second batch in the fridge after shaping and baked the first one. They came out soft and chewy, just what i like... BUT they got dry so fast! Like within minutes or even seconds. Every second counts, so I tried to gobbled it down as fast as i could haha. And within hours, I could throw the buns on the wall and they would probably bounce back! They were chewy as hell! Actually, this recipe calls for The whipping cream, not whipped cream. It add more milky flavour into the bread. Making bread is like an art. It needs proper dough kneading skills. If the dough is proofed appropriately, baked with right oven temperature. The bread will be wonderfully tasty. 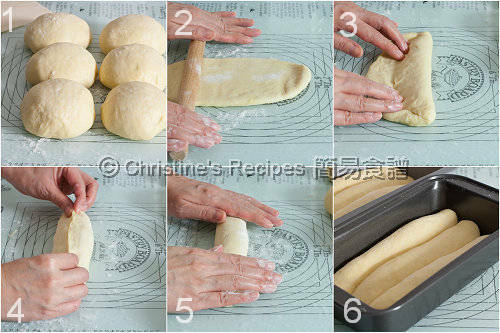 This recipe helps to make tangzhong dough, that's very sticky, compared to other kind of dough. It's much easier to make it in a bread machine. When kneading by hand, people tend to add more extra flour to prevent sticking to their hands. But it hurts the texture of the bread very much. Good thing I came back to copy the recipe. Lol It's 2:30 AM here and I was planning on buying the whippED cream first thing in the morning to try out your recipe! Quick question about tangzhong... Can I use milk instead of water to make it? Again, a little reminder, whipping cream is used for making this bread. Yes, you can use milk to make tangzhong, or use half water and half milk.